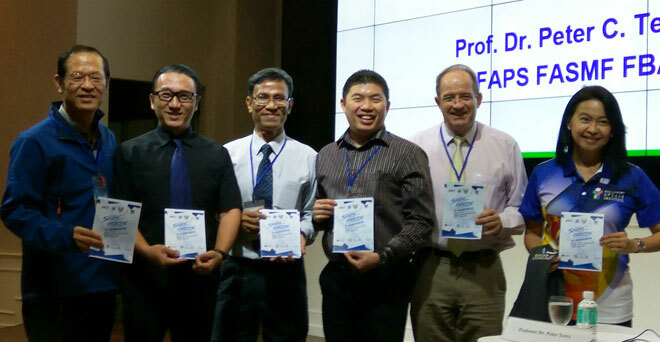 Dr Chin (second left) with (from left) Zhang, Naruepon, Garry and Peter promoting the 5th International Exercise and Sports Psychology Seminar at the recent TASPA Conference in Thailand. KUCHING: The 5th International Exercise and Sports Psychology Seminar has received further support and endorsement from the Asian South Pacific Association of Sports Psychology (ASPASP), Thailand Applied Sports Psychology Association (TASPA), Burapha University (Thailand), Seoul National University of Science and Technology (South Korea) and Chinese Culture University (Taiwan) at the TASPA Conference in Thailand from Nov 23-24. Prof Dr Li-Wei Zhang (Beijing Sports University), Associate Prof Dr Naruepon (Burapha University), Prof Dr Peter Terry (University of Southern Queenland), and Dr Garry Kuan (USM) also voiced their support for the seminar. Burapha University’s deputy dean of Faculty of Sports Science Associate Prof Dr Naruepon Vonjaturapat said his university and other universities in Thailand, Taiwan, South Korea and Malaysia will be sending their academicians and post-graduates students to this seminar as this unique event will bridge together international academicians, post-graduate students and practitioners to create growth and intensify cooperation between researchers and practitioners from various countries. Dr Chin Ngien Siong (IPGKTAR) who is the invited speaker at their conference extended his appreciation to Burapha University, TASPA, ASPASP, International Society of Sports Psychology (ISSP) and universities from South Korea, Taiwan, Thailand, Malaysia, Japan and Hong Kong for their support in the seminar. The two-day seminar is organised by the Sarawak Sports Corporation (SSC), Institute of Teacher Education Tun Abdul Razak (IPGKTAR) and UiTM Sarawak from Feb 6-7 next year at the Grand Margherita Hotel in Kuching. SSC chief executive officer Dr Ong Kong Swee added that there will be international prominent speakers, academicians and post-graduate students from South Korea, Taiwan, Thailand, Japan, Hong Kong and Malaysia presenting their research as well as conducting workshops during the seminar. The fees for the seminar are RM400 per person, with an early bird promotion rate of RM350 for registration made on or before Jan 15, 2018. There will also be a fee of RM150 especially for university and college students who registered on or before Jan 15, 2018. Normal registration fee of RM400 and RM200 for local delegates and students will be charged after the promotion period while foreign participants will be charged US$200 per person. The closing date for registration is Jan 31, 2018. Registration forms can be obtained from IPGKTAR, UiTM Sarawak, MSNS, ISN Sarawak and SSC. The forms and information can also be downloaded from the website at issep2018.ipgmktar.edu.my or at www.majlissukannegerisarawak.com. All payments should be made to the seminar treasurer Fidyadahlia Horian or Normawati Bahari at 082-673800 and online payments should be made payable to Pengarah Institut Pendidikan Guru Kampus Tun Abdul Razak, RHB Bank, Account Number 26114100000298. For further enquiries, call Dr Chin (019-8586898), Dr Ong (016-8626509) or Dr Clarence Jerry (013-8067122).